The next *broke-affordable arts fair will take place on November 26, 2011 at the Fellowship Hall in the Union Congregational Church in Peterborough, NH. *broke is a multidisciplinary arts event that has taken place in Peterborough, NH four times since its inception in 2008. The *broke philosophy is simple: art is for everybody. All *broke events are free to the public, and *broke vendors commit to presenting at least 75% of their wares for less than $50. 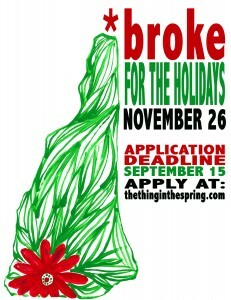 Vendor applications are available online @ www.thethinginthespring.com and will be open until September 15th, 2011.